The Semipalmated Sandpiper is one of the species that birders generally refer to as "peeps." Peeps are the suite of small shorebirds that all appear similar and may be difficult to identify. 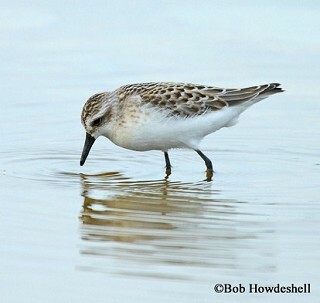 This small shorebird is found breeding in sub-arctic tundra in northern Canada. They migrate to the northern and central coasts of South America for the nonbreeding season where they may gather in upwards of 300,000 individuals staging together. Description: Small sandpiper with a short neck and moderately long bill that may droop slightly at the tip. Adults have a black center of rump and tail, back gray-brown, with a sparsely marked chest. Legs are black. Immature birds are similar to the adult, but have more of a scaly pattern on the back. Western Sandpiper is very similar, but usually has longer, more drooping bill. In breeding plumage and sometimes retained into early fall, they have a heavily streaked breast with a rufous patch on the wings. In late October, both Western and Semipalmated Sandpipers have reached nonbreeding plumage and may be very difficult to distinguish as bill length and shape varies among individuals. Least Sandpiper has yellow legs, which is unique among "peeps." They also have a dainty, drooping bill. Breeding adults have black feather centers with a brown to rufous edge and a heavily streaked breast. Juveniles are reddish overall, with more distinct markings on the chest, and yellow legs. Habitat: During migration, they frequent mudflats, sandbars, and pond and lake edges. Diet: Aquatic invertebrates with some terrestrial invertebrates like insects and spiders. Nesting and reproduction: Semipalmated Sandpipers have not been documented nesting in Tennessee. Status in Tennessee: Fairly common migrant across Tennessee. They arrive in spring by mid-April and can be found through early June. The earliest southbound migrants can be found as early as early July with lingering birds into November. Peak migration in fall is mid-July through early October. Populations are declining rapidly for unknown reasons. Semipalmated Sandpipers from eastern populations appear to complete a nonstop transoceanic flight of 3,000 - 4,000 km (1,900 - 2,500 mi) from New England and southern Canada to South America, powered by incredible fat reserves they build up prior to departure. The Semipalmated Sandpiper gets its common name from the short webs between its toes ("palmated" means webbed). The Western Sandpiper is the only other small sandpiper ("peep") with similarly webbed toes. Best places to see in Tennessee: Typical shorebird hotspots are great places to find Semipalmated Sandpipers, including Cross Creeks NWR, Old Hickory Lake,, and Rankin WMA. Gratto-Trevor, C. L. 1992. Semipalmated Sandpiper (Calidris pusilla), The Birds of North America Online (A. Poole, Ed.). Ithaca: Cornell Lab of Ornithology.